With the way gas prices have fluctuated over the years, it’s no surprise more and more consumers are turning to hybrid vehicles. At your Honda dealership near Barrington, we’re proud to be able to offer a select number of hybrids to Elgin and Schaumburg drivers, including the Honda Insight. In production since 1999, the Insight delivers a long-standing reputation as being a top gas-saving vehicle. Now in its second generation, it continues to show why it’s consistently regarded as one of the top hybrid models available. The Honda Insight made its debut in Japan in November 1999, making its way to North America a month later as first hybrid vehicle to be sold in the US. This Honda hybrid was also the first to feature Honda’s Integrated Motor Assist system which, when combined with optimized aerodynamics and a lightweight aluminum structure, helped to maximize fuel economy and minimize emissions. The 2000 model is considered the most fuel-efficient vehicle ever with an EPA-estimated 61 mpg highway and 53 combined mpg fuel economy rating. The first generation Insight was only available as a two-seater and came powered by a 1.0L ECA series three-cylinder engine and an electric motor. The second generation of the Honda Insight was introduced in 2009. Unlike the previous generation, this second-gen Insight was designed as a five-passenger, five-door hatchback that features the fifth generation of Integrated Motor Assist. The current Insight comes powered by a 1.3L four-cylinder engine along with a nickel-metal hydride battery pack and continuously variable transmission. Standard features, depending on the trim level, include stability control, a two-speaker sound system, cruise control, iPod/USB audio interface, an available navigation system with rearview camera, and Bluetooth. Elgin, Schaumburg, and Barrington drivers interested in learning more about the evolution of the Honda Insight are encouraged to visit Brilliance Honda, located at 680 West Terra Cotta in Crystal Lake. The Insight is a great vehicle at an affordable price that the entire family will enjoy. 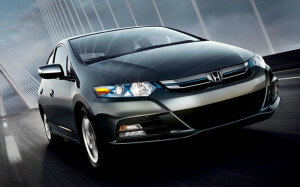 For more information about this Honda hybrid or any of our new or pre-owned models contact us at (888) 905-9883.